How do you qualify to compete for the National Titles Competition? This year at Dance Machine ANDC we are adding a Regional Titles Competition. You enter online for the Title Competition with your studio entry. If you wish to be considered for Title then you check the box for Title on the Solo Entry and an additional entry fee will be applied. If a dancer has multiple solos only choose one. If soloist entered for title meets the score requirement they will be announced as a Title Semi-Finalist and eligible to compete in the National Title Competition. From the Semi-Finalist at each Regional the Judges will choose a Regional Title Winner for each Age Division. Mini 5-8, Petite 9-10, Junior 11-12, Teen 13-14, and Senior 15-19. Boys and Girls Titles will be separate. You must be named a Semi-Finalist at a Regional Competition to be eligible to compete in the National Title Competition. It is not required to attend national if you are a Regional Title Winner but taking advantage of the opportunity is highly encouraged. Semi-Finalist will be Awarded a Medal and receive a National Title Information Packet. Regional Title Winners will be Awarded a Medal, Sash, and Tierra (girls) or Enhanced Medal (boys) along with a National Title Information Packet. The America’s Mister & Miss Dance National Titles Competition was founded in 2001. This program is not about the BEST dancer, but the search for well-rounded dancers with leadership qualities. The program is designed to help dancers take their life skills to the next level. Many dancers have stated over the years that participation in this program has made them more confident going into college interviews, scholarship and dance auditions, job interviews, and with public speaking. They make friends that last a lifetime. At America’s Mister and Miss Dance we do not select “winners” but rather a “representative” from a group of Winners. There is an Entry Fee for National Title Semi-Finalist…this will be paid to your studio and sent in with their national entries. Teachers will be able to enter the titles competition ONLINE. When entering National Solo Teachers may choose the America’s Mr/Miss Dance Option for soloist that qualified at a regional competition by being named a Semi-Finalist. Studio Owners/Teachers may contact our Office with any Title Entry Questions. All participating National Semi-Finalist receive FREE Video and Photo of On Stage Categories and The Awards Ceremony. They are also awarded a partial scholarship to the Gear-Up Dance Convention for the following season. Interview (35%) Semi-Finalist will meet with judges in a closed room for a conversation where the judges can ask questions to get to know the semi-finalist. For Interview Semi-Finalist should be dressed in Church/Business Attire. Group Dance/Audition Class (20%) A group routine (Jazz Style) will be learned in a closed Audition. Judges will come in after the routine is learned and judge the semi-finalist. Females wear a Black Leotard and tan/dark tan tights with jazz shoes, hair needs to be pulled out of the face in a ponytail or bun. Males wear black shorts or pants with a black t-shirt or tank top and jazz shoes. Stage Presence (10%) For this category semi-finalist wear a formal evening dress for females and suit/tie or tux for males to wear for this category.Semi-Finalist will enter the stage one at a time to answer an On-Stage Question. After all Semi-Finalist from an Age Group have answered a question the entire Age Group will come out as a Group in a Choreographed walking formation. This will be in front of an audience and judges. GRAND AWARDS CEREMONY: Evening Attire will be worn for the Grand Awards on Friday night. Preliminary Awards will be presented in each area of Preliminary Competition: Interview, Group Dance/Audition Class, Evening Attire, and Solo Routine. 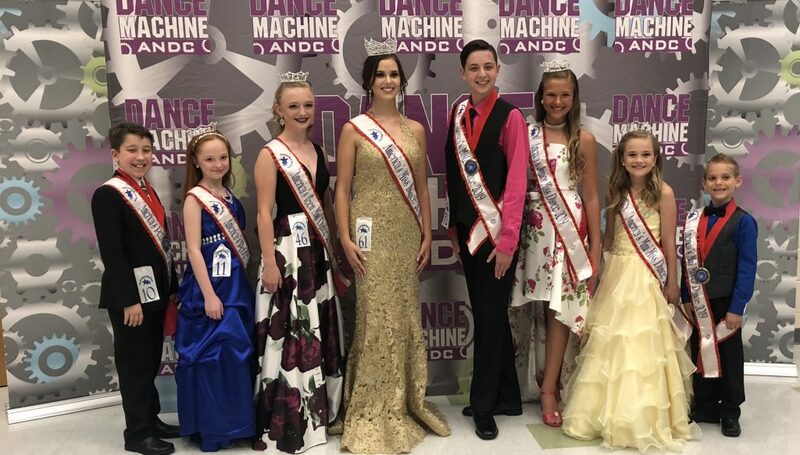 There will be several sponsor awards, the announcement of Finalist and farewells of 2019 title holders will be done…culminating with the crowning/awarding of the 2020 National Title Holders. We encourage the audience to dress nicely, especially semi-finalist parents, teachers, and family. You never know when there might be a photo opportunity and you always want to look your best. Following the Title Awards Ceremony will be The Red Carpet Party sponsored by Inside Dance Magazine.